I like the richness of the color of this comforter. It is not as soft as I would like but I believe after I wash it and use a softener it will be perfect. I always by King size because my beds sit high and I love the full cover look. The price was great, I highly recommend this set I feel like I have walked into a nice Bed and Breakfast spot every time I come home. I wish this set came with curtains, I will be ordering another Laura Ashley set for my mother. Laura Ashley Elise comforter bonus set features a texture floral print, makes a perfect addition to your bedroom. Texture floral design is done in dark and light shades of blue. Reverse has a dark blue ground with a light blue floral pattern. Coordinating decorative pillows are added to the set to complete the look. Breathe new life into your home by adding the sophisticated beauty of the Elise bedding collection to your bedroom. Loved the blues in this set, and it is all cotton. While it looked similar to the Charlotte, it offered more pieces. The only piece included in the Charlotte, not in the Elise, was the bed skirt. Since I have a sleigh bed, the skirt was unnecessary. And on top of it, the Elise came with several extra pillows but for much less. However, I wanted a matching shower curtain. All I could find was the Charlotte, so I took a chance and ordered two (I plan on cutting one up for window valances in the bedroom if they matched) and surprise! They matched the Elise set exactly. Why they sell under different names is a puzzle, but I took a chance on the curtains, ordered ELSEWHERE so I could return them without paying shipping if they did not match (Overstock now CHARGES for returns now unless the product is defective). I was pleased at how fast the comforter set arrived, and the updates I got on the progress of shipping. Not happy with the new return policy. Hey Overstock, what you see on-line is not always the same in person. I won't shop at Overstock if I think I might have to return a purchase unless I can see the product in a local store. Very nice, including the pillows, but the comforter is only 88" wide. Why on earth would they make it 88" when the standard width for queen sheets is 90" and many mattress are 14" or more thick? Four inches wider would certainly make this a five star item. I lovw this set! The pattern is the same as the Charlotte but without the trim on the edges. It is so stiking when I enter the bedroom with my cherry four poster bed. I am keeping the Charlotte so I can mix and match the pillows. I don't care for the Euroshams on the Elise, but the accent pillows are stitched and the blues are beautiful. It arrived early, and in perfect shape. The white is as crisp a white as I have seen and I will scotch guard it on a inconspicuous area just to add extra protection from spots, spills and puppy feet. I have ordered the valance in the Charlotte pattern and white panels for summer and spring rand navy velvet panels for the fall and winter. I have the shower curtain to go with with bath in the bedroom suite and it accentuates my blue and white china collection placed on white floating shelves. The room is a cocoon of peace. I also found fabric to drape over the four posters and shirred the canopy. I have become braver mixing patterns and it is stunning. Photos to come after I paint the walls and my rug arrives. So, so, so happy with the Charlotte pattern in king and the Elise in a queen. The Elise is 88 x 90 and I am still deciding if I will use my full mattress or queen. Definitely go with the king for the queen bed as it looks lush not skimpy. It makes the proportions lovely. With crystal lamps and white silk shades, I have created my oasis. I love this pattern but as has been pointed out by several others it is not the right size for a queen mattress. There is no bedskirt, but unless your bed has a wooden side panel it will not cover the mattress correctly. I took the advice of one and bought the king size instead. Not sure it really helps as it is very long on the sides but if you put the comforter at the top edge of the mattress it is to short at the foot end. If you leave further from the top and fold back the top sheet to let it show, thereby gaining more length for the foot of the bed then the corner points drag on the floor. And of course the king size shams are too wide for the bed. It is so sad that this just isn't what it could be. It would also have been nicer to have a decorative pillow that contrasted more. The larger decorative pillow is the same fabric as the comforter and just disappears when you put it on the bed. It will look nicer when I use the reverse darker blue side but right now it adds nothing. Still, all in all for the price I really think this is a pretty set. 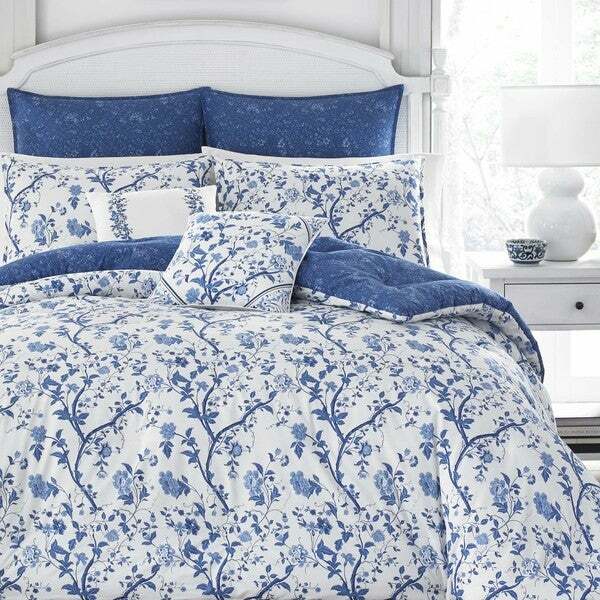 This comforter is absolutely beautiful! I was looking for a comforter set that was blue and white in color. When I came across this one, I was hoping it would be just as it looked in the picture and stated correctly in the description. I was not disappointed. The material is great quality. The comforter is thick and cozy. I had read in the reviews that the Queen was rather short on the Queen size beds, so I ordered the King size. It fits perfectly on my Queen size bed. I like for my comforters to hang low off the bed so I don't have to use a bed skirt if I don't want to use one. The colors in the comforter and pillow shams are vibrant. I was very surprised at how beautiful the blue is. It is a true Navy blue. The white is a true white, not an off white. I highly recommend this comforter set. It is a wonderful price for a high quality product. I’m redoing a guest bedroom, wanted to make it brighter, &amp; wanted a blue and white theme. The comforter set is very pretty. Based on other reviews I ordered a king size for a queen size bed &amp; I’m very glad I did in order to get the draping that you see in the pictures - because of this I had to purchase 2 king size pillows for the shams. You will also need to purchase 2 European pillow inserts in a 26x26 size. I also recommend purchasing a 2nd Laura Ashley Charlotte 16” decorative pillow to complete the look if you like a balanced look like I do. I’m in Florida &amp; the comforter weight is good for me, however, for those in cold climates, you’ll want to add a blanket. I love it &amp; think you will as well! This comforter set is just exactly what you might expect from Laura Ashley. 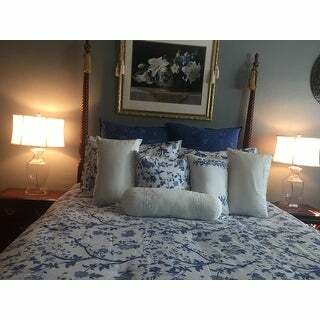 The quality is really lovely, it has all the extras with the Euro pillow sham, a pillow sham and two decorator pillows. Just the perfect set if you need something blue. The colors are beautiful and just as shown. I am very happy with the colors and the pattern. I have one problem with the pillows. I accept the dark blue Euro shams--those are not standard. The 'standard shams' are not standard and are not the measurements given in the description. The measurements on my pillow cases are 4" and 6" smaller than the measurements listed. They are small shams and a standard pillow will not come close to fitting in them. It was disappointing not to be able to put the new shams on my standard pillows. Now I must try to find pillows to fit all these shams or stuff them. I expected better of this brand. I loved this set. Very pretty! But the comforter wasn't large enough for my king sized bed even though it was a king size comforter. So sorry I had to return it. Still waiting for my refund. This is exactly as pictured. Very nice set; vibrant colors. This is a beautiful set. All cotton which is unusual and great. Delivered very quick. Exactly as described. Very nice product. This set was of the utmost quality. It's exactly what I was looking for. It is summer in a box! I have never written negative reviews of products in my life. But these two purchases are so BAD, I felt I had to so nobody else makes this mistake. This set is so cheap it is hilarious. I actually laughed out loud. Super scratchy and thin material looks like it came from the *** Store. It looks nothing like the picture and is way overpriced for the lack of any quality. Come on Overstock, do you even know the products you sell. I love this 7-piece set. Worked very well with my new sleep number king-size bed. I love the pillows and the blue combination. Makes my room really beautiful. We are quite pleased with the high quality of this comforter set. It was exactly as pictured and described in the listing and we also purchased some Egyptian cotton sheets to coordinate with the blues in the print. Nice quality and great value. Beautiful set. I found the quality of sewing to be outstanding. The size queen full gave me a wonderful fit on my full size bed. The material is soft and easily washed. I really like the colors of this bedspread. I can't quite rate it a 5 star due to the cloth being basic quality (Definitely not upper end - I guess you get what you pay for in this instance). That being said, it is still a nice comforter, and I will get the enjoyment of this accompanied with my Gold sheets (Will make it SO Italian looking!) I am actually excited with that lol. It's worth the price, and I am happy with the purchase. "My king bed is extra large king. Will this fit. ? " "Does this come in a King size?" "Are there curtains to match this comforter set, or a solid blue that would match?" No. I have a White dust ruffle and valance that match each other to complete my set. I bought the matching shower curtain and made a valance. "What is the thread count for the Elise set? " This is a comforter set. No bed sheets are included. I have only heard of thread count when pertaining to sheets. "Does the Elise comforter match the Charlotte shower curtain?" "I purchased the Elise set for my guest room and love it. Would love to have the bed skirt like the one in the Charlotte set that coordinates with the Elise set. Is there a way to purchase the bed skirt to go with the rest of the Elise set?" Unfortunately, we do not currently carry a matching bed skirt. "Are there sheets to match? And what would you suggest for the solid blue shams?" I searched for sheets to match but couldn't find any. However, I have had Laura Ashley sheets in the past and they tend to "pill/"" I'm sticking to a plain white, good quality, high thread count sheet set to go with this comforter. Hope this helps!